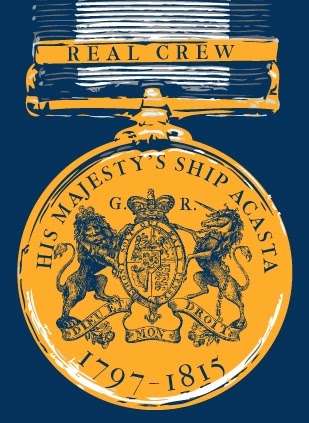 Today continues the prolong'd weekly series wherein we introduce to you some of the REAL Acastas, the men who served aboard at some point between the period from her launch in 1797 to her final year in service to the Crown in 1815. Stop back every Monday to meet an all-new, REAL Acasta! John Alexander entered the Navy, 5 May, 1800, as Ordinary, on board the Fairy 18, Capts. Fred. Warren and Rich. Dalling Dunn. If we except a brief attachment in 1804, and again in 1806, to the Aeolus 32, Capt. Lord Wm. Fitzroy, and Hurcule and Veteran, Capts. Barrington Dacres and Andrew Fitzherbert Evans, he afterwards, from Nov. 1801, until the early part of 1807, served uninterruptedly with Capt. Dunn, and nearly the whole time also with Admiral Sir John Thos. Duckworth, in the Southampton, Leviathan, Hercule, Acasta, and Royal George, on the West India and Mediterranean stations. While in the latter ship, he took part in a desperate skirmish with a body of Turks on the island of Prota, 27 Feb. 1807, and was severely wounded at the re-passage of the Dardanells. Being promoted to a Lieutenancy (by commission dated 28 Feb. 1807) in the Standard 64, Capt. Thos. Harvey, he subsequently, on 26 June, 1808, succeeded, with the yawl belonging to that ship under his orders, in capturing a French despatch-boat, Le Leger although exposed to a sharp fire of musketry from the island of Corfu.